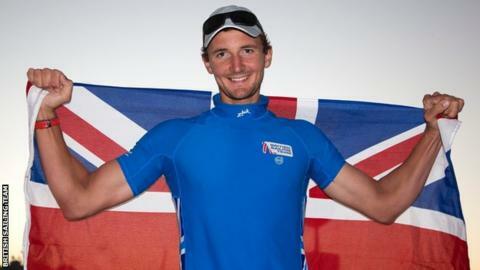 Finn world champion Giles Scott has become the eighth sailor to join Sir Ben Ainslie's British America's Cup team. Ainslie was selected ahead of Scott to represent Great Britain at London 2012 and won his fourth Olympic gold. Scott, 27, has built on Ainslie's success and won Great Britain's only gold medal at September's sailing World Championships in Santander. Ainslie is spearheading Britain's bid to win the 35th America's Cup in 2017. No British team has won it but Sir Ben Ainslie is hoping to change that with his new team. Takes place roughly every three to five years. The winner decides the rules and venue of the next event. As holders, Oracle Team USA have revamped the format. Qualifying rounds have been streamlined and will start in 2015 with the finals likely to be in June 2017. "There are a handful of sailors of his generation in the world that stand out as really a cut above the rest, and Giles is clearly one of those," Ainslie said. "We have been very selective about the people that we have brought in and we know that they will gel with the team. And with Giles, it was a 'no-brainer'. "A good team player and a winner. We are very excited about him being with us." Scott, who is favourite to claim gold at the 2016 Rio Olympics in the Finn class, competed for Italian team Luna Rossa in the 2013 America's Cup.